In the first two parts on Wedding Cake photography I talked about how I do portraits of the whole cake in different lighting scenarios. This part will focus on our next step in the process—the details. I really enjoy this part because it’s where we can be the most creative in our compositional set-ups. It’s very much like doing table-top product photography in the studio except I don’t have all my lights, tools, or the time. In my studio I can mull over the composition and lighting for hours, but at a wedding reception the challenge is to create studio quality images in minutes! So, to make this possible while I’m doing the overall cake table photos, Kathi is raiding the bride & grooms’ head table for additional items (we already have their bouquettes) to include in the detail set-up like: toasting goblets, favors, the wedding invitation, and of course, their rings. We did this kind of still life at most weddings…. I’m proud of this award winning image because it embodies my lighting philosophy, showcases our attention to details and composition, was done at the actual wedding reception, and the Bride and Groom Loved It! Lighting: Natural Light through a window of course! This is the First thing I look for when I walk into a reception site. Placement: With the cake table near a window then I rotate the cake so its best side is being skimmed by the soft directional window light. Invitation: With my camera’s point of view established I let Kathi know the best spot for the invitation and she places it and all the other elements around it. Exposure: This was done on medium format film, so, I don’t have the exact exposure data, but I did most of these still life portraits on Fuji, 800 ISO, Color Negative Film. So this was probably done with a shutter speed of around 1/4 to 1/2 sec., to get to an f-stop of f11.0 or f16.0. I always did these still lifes locked down on a heavy tripod. The competition print of this image gave me one of the Merits I needed to earn my PPA (Professional Photographers of America) Masters Degree in 2002. Lighting: Sometimes you get a reception site that just does NOT have any windows. That’s when YOU must provide the light or use what’s available. A SpeedLight as a Source: I’ve always detested any hot-shoe mounted flash being pointed directly at any subject. So, I was always looking for the next best flash diffuser that would soften the light and increase its size as a source. In addition I wanted one that would work well when in a bounce mode, which is where I always had my flash set when doing weddings. The diffuser I used for this image of the rings has been my favorite for many years—The Gary Fong Lightsphere. The Placement and Set-up: Kathi placed the rings on one of the glass beads in an up angle, which made it easier to get light into the diamonds. Then I flipped the flash head pointing straight up (you can see the Lightsphere’s shape in the reflections on each glass bead); this gave the rings and set some front light and some bounce light off the ceiling. Here’s another at the Ritz-Carlton, Half Moon Bay…. 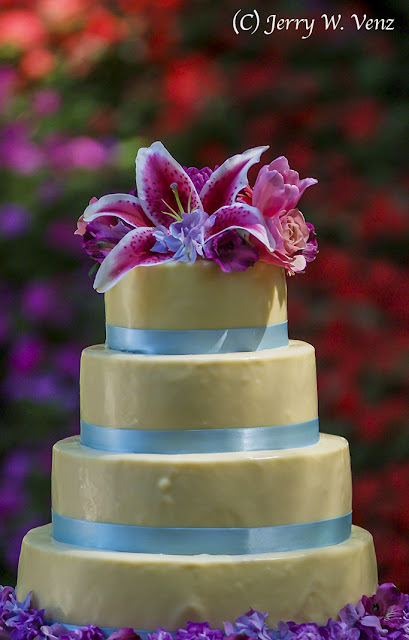 Placement: We went for a vertical composition with one flower petal under the rings so they would stand out better (more contrast) on the cake. Lighting and Exposure: I use the Fong Lightsphere, again pointed straight-up, to get some bounce off the ceiling. I slowed my shutter speed to 1/20 sec., to “drag-in” some ambient room light. This makes the resulting image look less like a flashed image. So, with these three blogs I think I covered any likely lighting scenario you may encounter in wedding cake photography. If you have had a difficult lighting situation that I did to touch on here tell me about it! ’Til next week…. 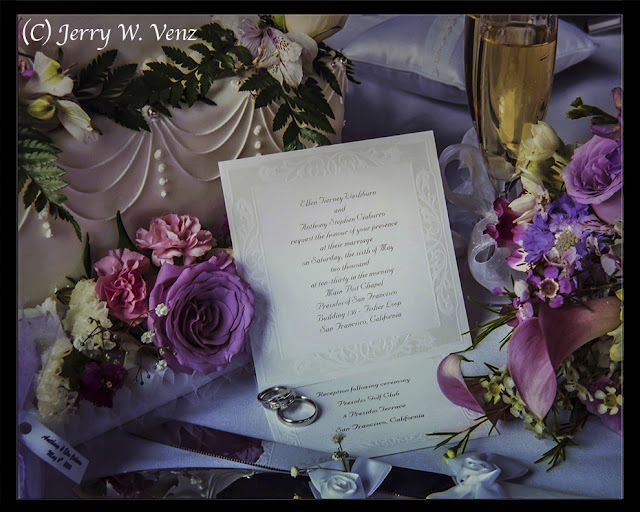 My 40+ years doing fine art photography, with over 25 of those years doing weddings and portraits, I’ve learned that as a professional, drama sells. The best way to create drama (especially of a static subject) is with dramatic lighting—that means Directional Lighting; Light that Does Not come from camera position! In Part 1 of this blog series I discussed this topic using “unmixed lighting”—that is single source lighting, which is pretty easy to deal with. This week’s topic covers “mixed lighting” and outdoor natural lighting, but my rules still apply—I’m always looking for or creating directional light. So, What is Mixed Lighting? In weddings it’s often an interior setting where we have artificial lights (lamps, chandeliers, or overhead fluorescents), natural light from windows, and sunlight that can be seen through those windows. This challenging scenario can happen in churches, homes, hotels and often in reception halls. This is why wedding photography is one of the most technically difficult photographic occupations. In addition we must be able to solve all of these technical problems in minutes (not the hours or days that commercial photographers have with their subjects) while our clients watch and wait within a timeline that we have NO control over! Here is a mixed lighting example…. good: the sun was setting knocking down the outside light. bad: the windows were tinted and the light on my cake was low. good: I have window light! bad: too many windows creating light on both sides of the cake creating Non-Directional Light. 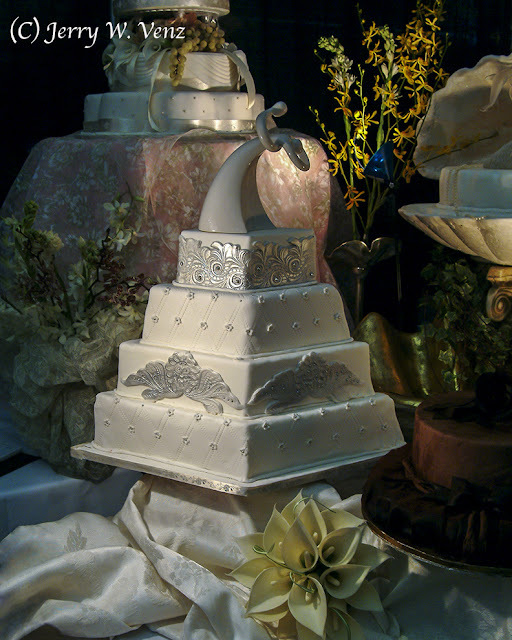 I moved the cake table towards a wall on camera left until I got a shadow side on the cake; now I have Directional Light. This is called Subtractive Lighting—a technique I use in outdoor Natural Light portraiture. Using my Incident Light Meter I measured the light falling on the Highlight Side of the cake, while I raised the meters ISO to get to an f-stop with good depth-of-field and a shutter speed that I knew would drag-in the light from those candles: ISO 800 got me f5.6 at 1/15 sec. I did my test shots (I LOVE digital cameras!) to check how the outside looked. Great! We got lucky with the time of day. Put my grey card on the highlight side of the cake and did a Custom White Balance. I checked my histogram to make sure I was not Clipping the Highlights. While I was doing these things Kathi was busy decorating the cake table. She gathered the bridal and attendants' bouquets and arranged those various elements to create what you see. NOTE: No matter what the reception staff do to decorate the cake table we usually redo it. In some cases they seem to do their best to sabotage our cake photography. One of their favorites is to stack ALL the serving places ON the cake table to make their job easier to serve-up cake slices to the guests. We remove them and then put them back. This was done at the Ritz-Carlton in Half-Moon Bay, California. We were on their preferred vendor list and we never had to redecorate or fix “sabotage” to the cake table. They were always a class act. They put this small cake table between a set of windows, but their decor was so elegant that I used that decor as my background. They had placed flood lights behind and from above left on the cake. I used my Incident Light Meter to measure the light from the flood light hitting the left side of the cake. I wanted a couple things here; I wanted good depth-of-field to handle both the cake and the background. 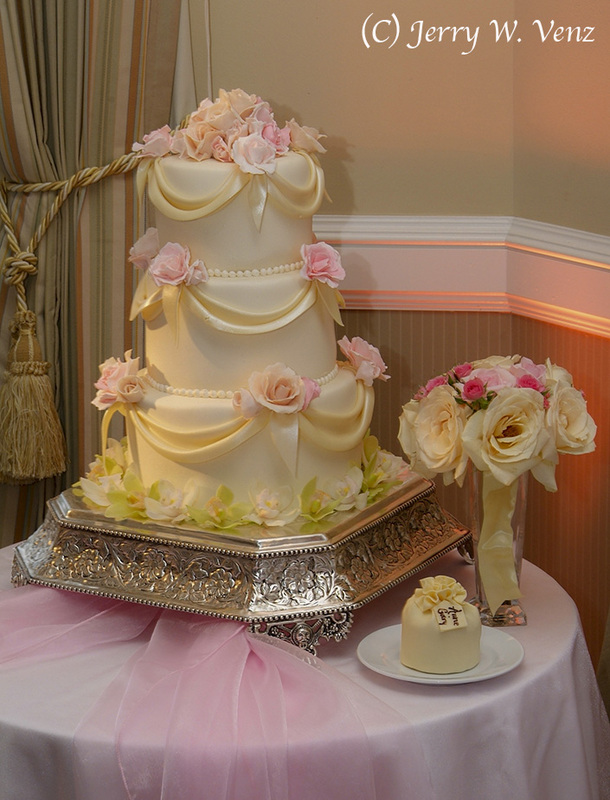 And I wanted that pink flood light behind the cake to be seen since it matched the colors in the cake. I experimented with shutter speeds form 1/8 sec., 1/15 sec., and 1/30 sec., with their appropriate f-stops at ISO 400, I settled on 1/30 sec., @ f8.0 since that gave me enough color around the cake without polluting its surface and good depth-of-field. 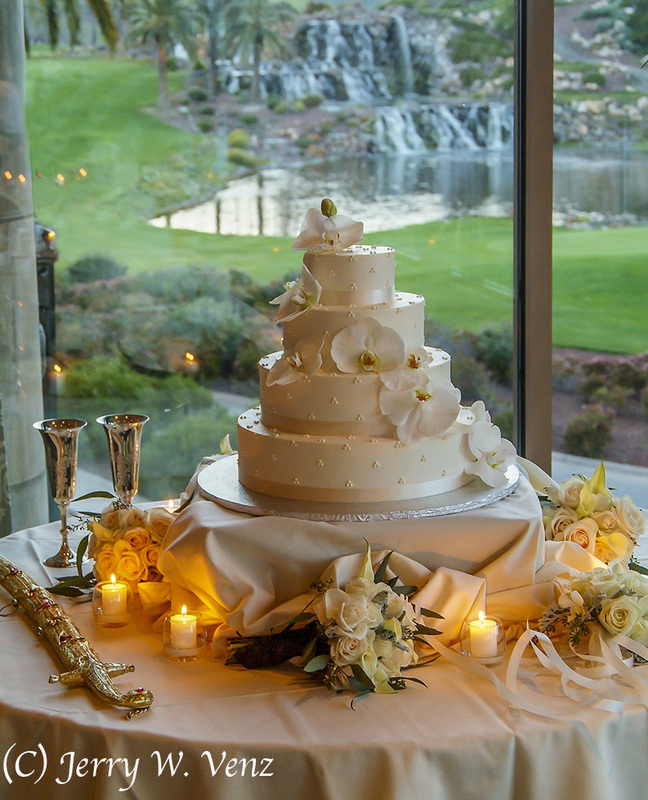 This was done at Nestledown (Los Gatos, California), one of my favorite wedding venues because the place looks like it was designed for photographers. Everywhere you look there are fabulous backgrounds and settings for photography. 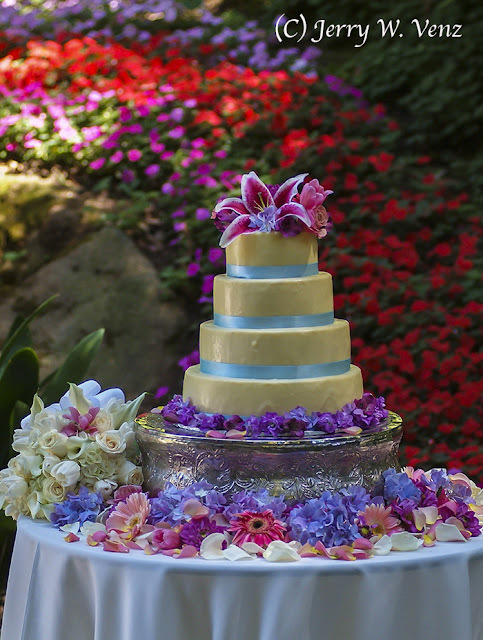 The basic rule for cake placement outdoors is to have the cake placed in the Shade and then I just deal with the ambient lighting. Before I let Kathi decorate the cake table I rotate my camera position around the table looking at backgrounds. You can see why I picked that multi-colored floral hillside as my background—those colors went perfectly with the floral colors of this wedding. The Lighting is coming from the Left (open sky) with additional top light. There’s a steep tree covered hillside on the right. I got the overall cake table portrait and decided to go for a close-up with a Bokeh background. The light level is low so I go to ISO 1600, back-up and zoom to 200mm @ f2.8 and then the sun peaks through the trees lighting up the cake! Rolling my shutter speed up to 1/500 sec., (spot metering) I get this nice close-up. 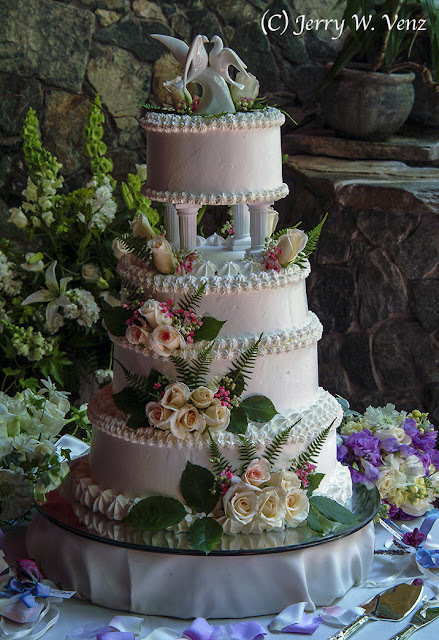 Over our 25+ years doing weddings, my wife Kathi and I always tried to create wedding cake images just like they were commercial product assignments for a magazine ad. We thought that any photography we did at the cake table, just as we did the bride’s trousseau, was important enough that we took the photography to a dramatic level beyond the reception record-shot—like most photographers did—and still do today. The bottom line in my philosophy of photography is creating drama and drama is all about LIGHTING. However, all lighting isn’t equal—the best lighting for things is directional light that comes from some other direction than camera position. Three dimensionality; because the camera converts the 3-D world into a two-dimensional recording of reality is up to us as professional photographers to create the illusion within that two dimensional capture with a directional light that makes shadows. Texture/Detail; directional light that sweeps across the subject from one side or the other (or the top) accentuates detail because of the shadows. We use this directional light on wedding dresses as well to show the detail of the gown. Drama; dramatic lighting = Shadows! I don’t care how you do it; you can use outdoor natural light, indoor window light, continuous artificial lights, or flash, but YOU as the director of photography, at each of your bride’s weddings, should be in charge of the lighting. So, here are some of my favorite lighting techniques…. 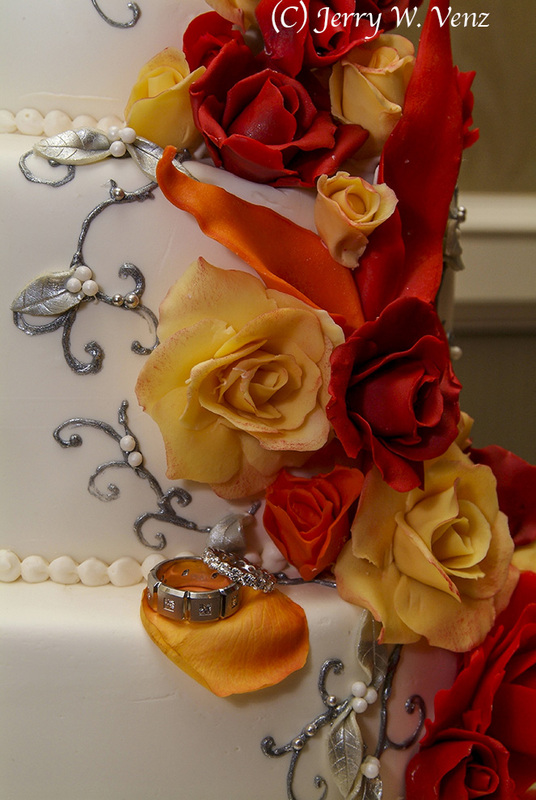 This image was done at a wedding fair of a cake by one of my favorite wedding cake designers, Bijan of San Jose, California. The lights were quartz halogen desk lamps that produce a very hard “cutting” light that really enhances detail and makes dramatic shadows. However, you must be careful with your exposure to avoid clipping those highlights on white wedding cakes. 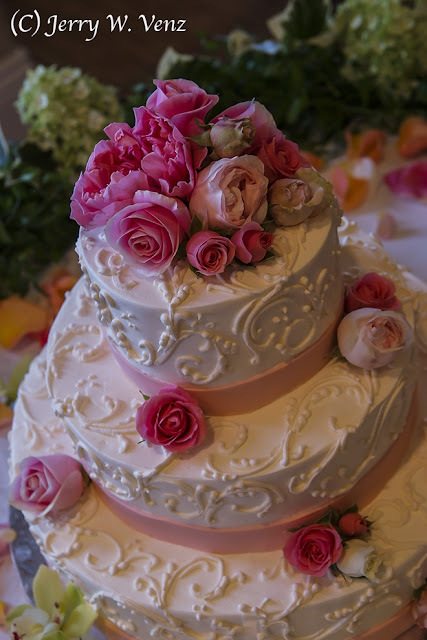 It’s essential to maintain detail in your whites on a wedding cake—not to mention your bride’s dress! My favorite light source is Window Light…. If I have a wedding reception site that has great windows (provided it’s NOT a night reception!) I will actually have the reception staff move the cake table to take advantage of that light. You don’t want reception staff to be in charge of anything that affects your photography—especially lighting! NOTE: This is something that is part of your research at each wedding. When you visit all the photography locations, in advance of the wedding, you should be looking at lighting and locations for your set-ups. Ask the manager where they usually put the cake table—they usually put it somewhere that’s merely convenient for them…and almost always under an EXIT sign. 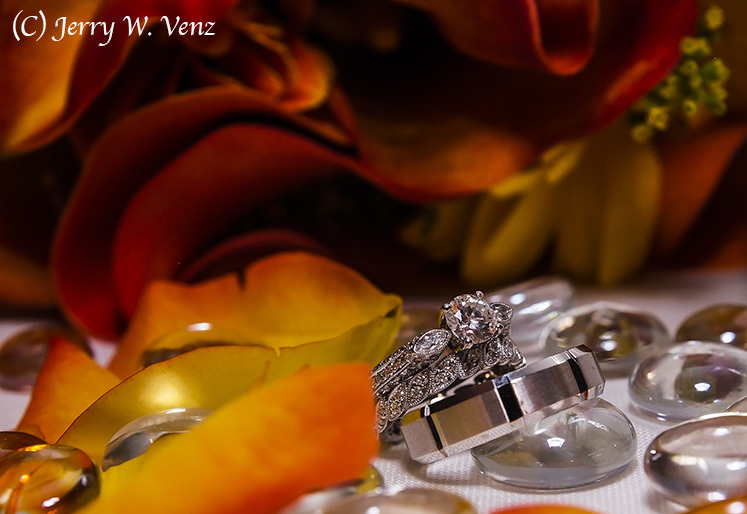 If it’s not where you want it politely ask the manager to have it set-up where “the bride wants it”; works every time! Nothing creates this nice soft light, wrapping to a gradient shadow, like a large window. This is something that a speed light just can’t do well because being a point light source makes them too hard. Most of the time we arrive at the reception site early—before they let the guests in—so we can photograph the whole room and then get locked-down on a tripod at the cake table for the cake portraits. 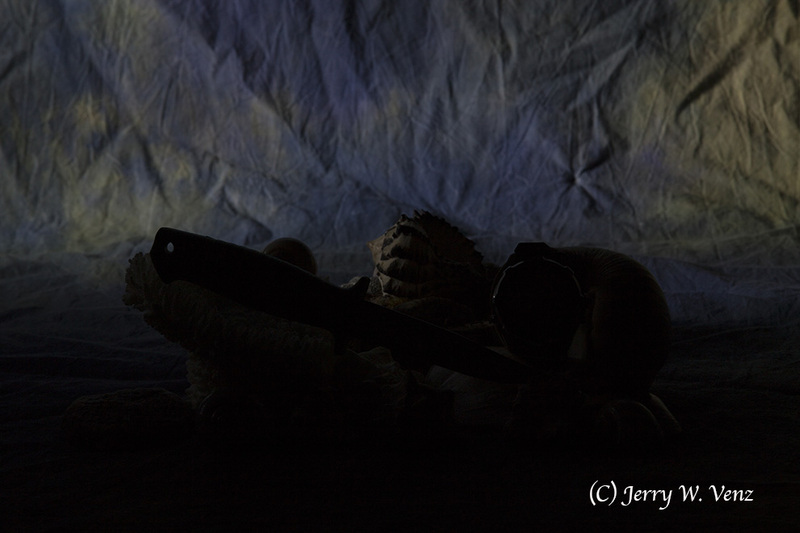 Last week’s blog was about how I light painted two black pistols. That was challenging, but after I narrowed the light’s angle it was surprisingly easy because that modification gave me the precision needed to realize the old studio lighting maxim: “put light where you want it and don’t put light where you don’t want it”! In this studio light paining blog I picked something more difficult—a very reflective knife. 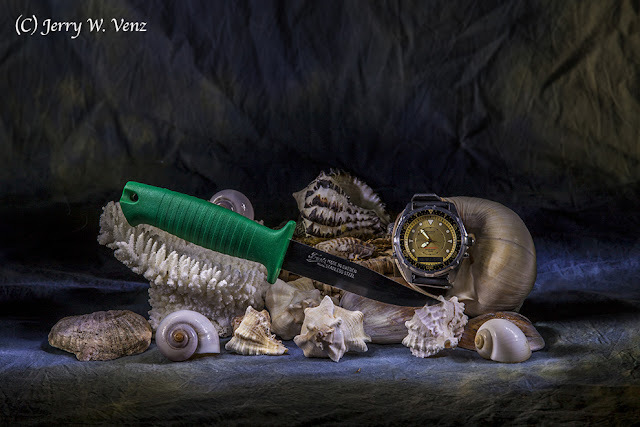 It’s a polished, stainless steel, dive knife that I paired with a vintage, stainless steel, Casio diver’s watch. To complete the set-up and enhance the dive theme I added a bunch of sea shells and a piece of white coral. Yeah, it’s complicated and a bit busy and after messing with the composition of all these elements I decided that the knife should be the center of interest because of its size and the powerful color of its handle. I had intended to make the watch the center of interest until I saw that it didn’t have the impact to lead in this set. Here’s the final edited image…. Lighting: In Part 1 I told you that I had to make a snoot (made of Cinefoil) for my flashlight to reduce the beam size for more accurate placement of highlights on my subjects. Well, because my subjects here are smaller and with all those tiny sea shells needing precise lighting I reduced the size of my snoot’s opening to about pencil size. Painting: You may be asking, “How did he get the blade of that knife without reflections from the flashlight?” that was my intent from the start—I wanted it to look almost black because I wanted the inscription on that, chrome like, polished blade to really stand out. So, when painting I swept my flashlight over the top edges of my set pieces (especially on the knife’s handle) without creating any forward angle that would front light the blade. Then I swept the light from each side working on all those shells. Eliminating blade reflection: You’ve probably heard the term, “angle of incidence equals angle of reflectance”, this just means that if the angle of your light matches your angle of observation you will see a reflection. Family of Angles: This refers to the Angles of view from a light source that a reflective surface will direct light back into the lens. For a flat surface the family of angles are the same as the lens’ angle of view—but coming back toward the camera. The Solution: Change your angle of view (lens focal length) so that the cone of light misses the lens. So, I used a longer focal length (200mm) from a greater distance to reduce the family of angles (the cone of light). Now that the light is outside the family of angels light will not reflect back into the lens, thus eliminating direct reflections. And that give me my dark blade! The Background: With so many more elements to paint I used up my 30 seconds on my subjects, so I had to do a separate exposure for the background. Note on Color: One of the problems when painting with an LED flashlight is that the LED light quality (its color temperature) can vary wildly between manufacturers. This is called its CRI—Color Rendering Index—which ideally should be 100 or 5500°K, the color temperature of daylight. Most LED flashlights are not even close to a CRI of 100 (I often saw a very blue shift in color in my painted set-ups using cheap LED flashlights) and most sellers or manufacturers won’t even tell you in the specs anything about its CRI! When I did find some LED flashlights with color temperatures at 5500°K (CRI100) they were really expensive ($100 to $350) and there was little variety in configuration compared to the cheap LED lights—such as multi-LED wands and such. My Solution for Color: I simply started doing a custom white balance for each LED light. You just light paint a grey card exactly the same as painting your subject (same exposure) and you’re done.